Nothing Is More Effective In Getting Our World Healthy! That is a pretty strong statement but it is true. While everyone seems to be looking for the magic pill to improve health, we have the cure and best preventive medical approach - Quality Physical Education. See below all the benefit of physical education. This is why we often say, "PE Teachers have the most important job in the world." Physical education(PE) is the most powerful (and unappreciated) 'medicine' for present and future health issues - For the body, mind and spirit. When you look at the section below and some of the quotes from respected world organizations, you can see why we say nothing is better than physical education. Physical education in schools captures everyone and not those who want to be active. It teaches great life and health lessons. Putting it simply, PE conditions a child to be more active and healthy adults. However, there are trends around the world which are disturbing. 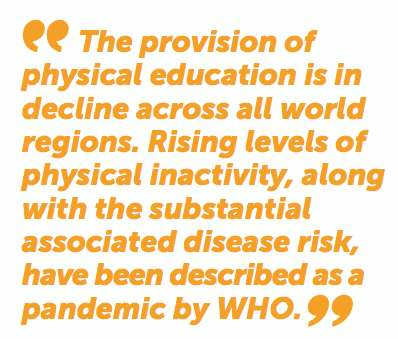 UNESCO states, "physical education is in decline across all world regions". In the USA, the average school budget for PE is $764 per year. In other countries the value of quality PE is being challenged. On the positive side, we have more and evidence and research that physical education is the ultimate solution to producing a more healthy world....for a body, mind and spirit of humans. Look at the facts below. PHIT America is totally committed to expanding quality PE programs throughout the world. 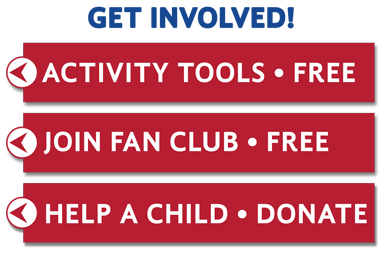 By kids be active at least 3 times a week in PE, we create more PHIT KIDS who are healthier and smarter. Learn about PHIT KIDS HERE. Physical Education Benefits - Broad & Powerful! Improved academics - The big bonus benefit! 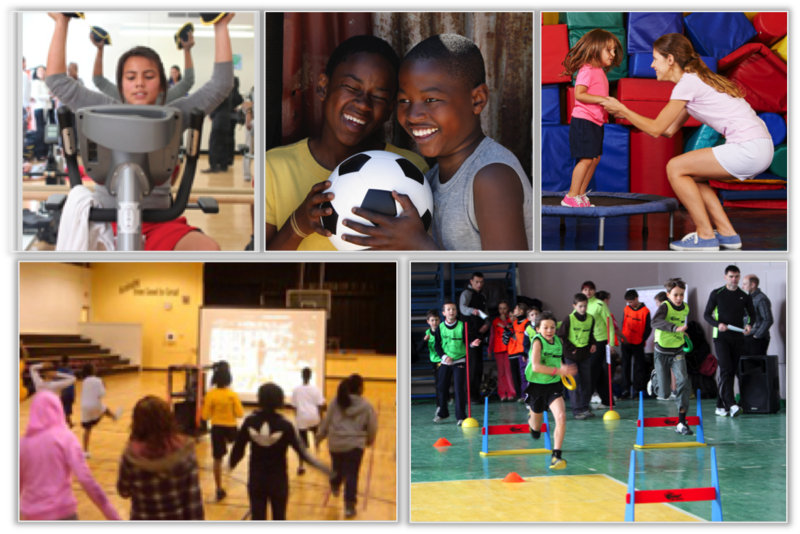 Healthy For Life -Kids who have quality PE are taught life skills (see above) than can be used forever. Reduced Healthcare Costs - We have more of a 'sick-care' system than healthcare. One of the best ways to prevent 'sick-care' expenses to have real healthcare. PE is true healthcare and prevention. As been mentioned "Prevention is Better than a Cure". Physical Education Captures Everyone - Recess is nice. So are after school programs but lets not just get the kids active who want to be active. Physical education gets every child conditioned to live a healthy life. The Academic Payoff - The research and evidence is overwhelming. Kids who are active are better students period. Look at this document for all the research we have accumulated to date. And look at the study of 3 million children below. Fitness = Better Academics! Physical education is the grassroots program for all activity. See below how children with PE are 2-3 times more like to active outside of school. And, the chart to the right shows that adults who had PE in school are twice as likely to active today. Look at the brain functioning after just 20 minutes of walking. Getting kids to move helps strengthen and stimulate their brains. 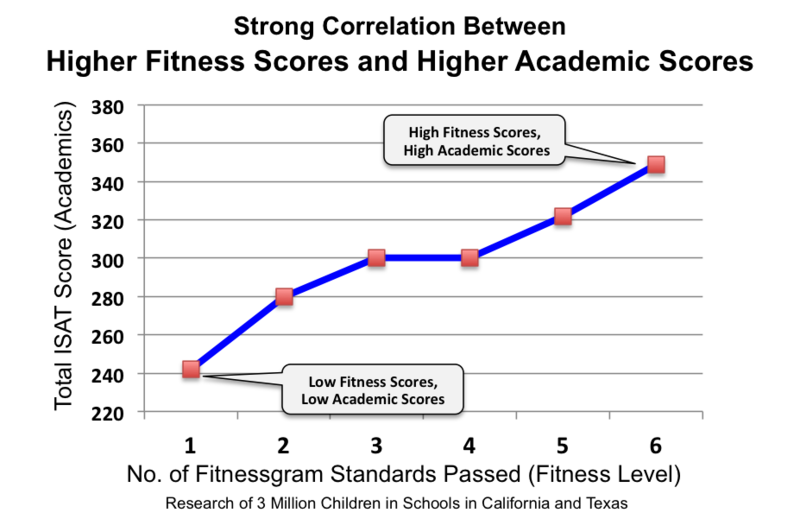 This is why so many recent research studies are showing increased fitness = improved academics. Note: The blue color represents inactivity in the brain (Source: University of Urbana) The chart to the right how more active kids are better students. John Ratey, an Associate Professor Psychiatry at Harvard University has stated, "Exercise is like Miracle-Gro for the brain." So, when anyone says we can't afford to have PE in our schools because it takes up too much time, please let them know of all the research which conclusively shows how exercise builds brain cells and improves academics. And, just by elevating your heart rate you can lift your mood, beat stress, sharpen your intellect, and function better. LEARN MORE HOW INCREASED PHYSICAL ACTIVITY IMPROVES ACADEMIC PERFORMANCE HERE.